The teastar wireless in-car speakerphone is a simple solution for safe driving.With Mic support handsfree calling and support voice control say "YES" to answer say "NO" to reject so that you can keep your eyes on the road.The sleek and compact design looks great in any car.This device can be used as hands-free kit both in car or as conference speakerphone on desk when you are at home, in office, etc. Double press the circle answer key to stop the calls temporarily so that you can answer another call. 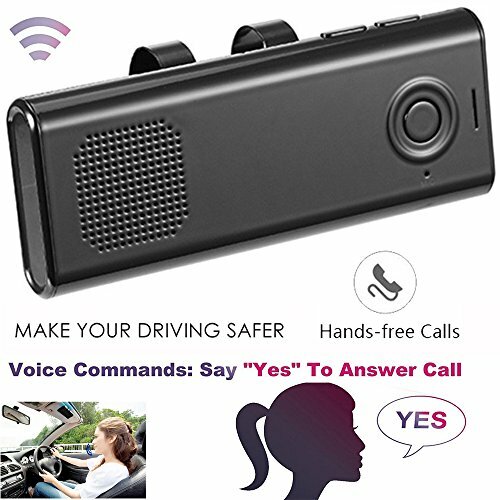 SAFE DRIVING GUARD:Built in microphone support hands-free calls, hang up calls, reject calls, last number redial, volume control, play music through this speakerphone, keep your drive safe and stay focused on the road ahead while enjoying hands free calls and control over your phone. VOICE ANSWER: Say "YES" to answer a call and say "NO" to reject a call no need to press the answer button or your phone, With Noise Cancelling technology and 3 watts speaker Design for transfer great sound of music, radio, GPS Navigation or any other type of audio from your Bluetooth device with HD quality voice and music, Build-in high sensitivity microphone with DSP noise cancellation technology to improving Call Quality. SIMPLE TO USE AND INSTALL:Just attach it to your car's sun visor via its durable and magnetic clip. Activate your Bluetooth function to search this device"YET-Safe" and pair with it. Once paring, next time pair automatically. POWERFULL COMPATIBLITY:Available for answering and receiving nearly all calls with any bluetooth smartphone iPhone Samsung android and blackberry etc. Signal reception within 10 meters. If you have any questions about this product by Teastar, contact us by completing and submitting the form below. If you are looking for a specif part number, please include it with your message.